This is a beautiful example of J. N. Bellin's important 1764 map of New York City. The map depicts what is today the Financial District at the southern tip of Manhattan between the Hudson River and the 'Canal de la Longue Isle' or east River. Bellin's plan of New York is taken directly from an inset attached to J. B. L. Franquelin's 1693 regional manuscript map. Cartographically most of the raw information upon which the map is based was likely drawn from the French pirate and ne're-do-well, John Reaux, who became a citizen of New York City in 1692. A French naval invasion of New York was very much on the cards throughout much of the Colonial Period, but for such to succeed the French needed intelligence. For this, they turned to the French privateer John Reaux, who was naturalized as a citizen of New York in 1692. No sooner had Reaux become a New Yorker than he attempted to capture a ship and seize its contents - several thousand pounds sterling! Reaux fled to France to avoid imprisonment and there, according to his own confession, he was interrogated by naval authorities regarding the feasibility of an attack on New York. 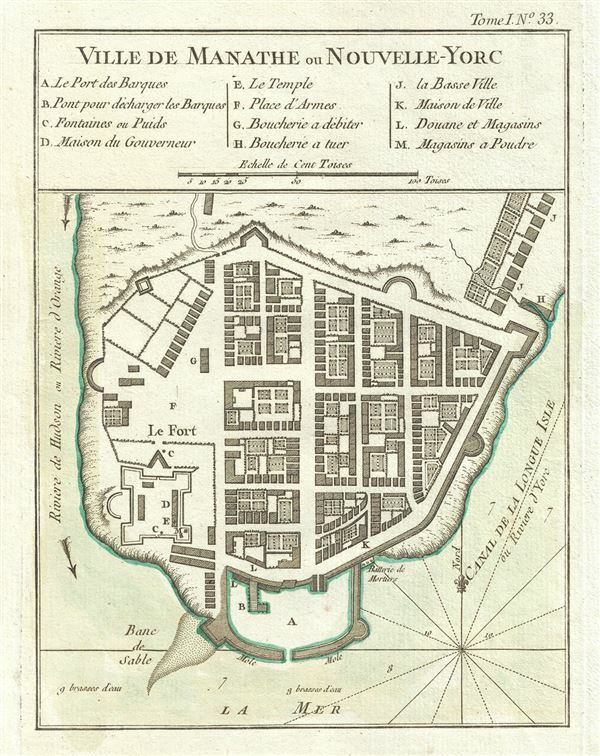 It is from this interrogation that the original Franquelin plan of New York may most likely have been composed. Bellin of course, published this plan nearly seventy years after the Franquelin plan. Upon initial consideration, it seems shocking that no subsequent maps of New York City had become available. There were in fact several superior plans of New York, however, these were closely guarded British secrets and would not have been available to the French Hydrographer General. Augustyn, R. T., Cohen, P., Manhattan in Maps 1527 - 1995, p. 50-51. Haskell, D., Manhattan Maps A Co-operative List, nos. 296-302. Tooley, R. V., The Mapping of America, 124, state 2.